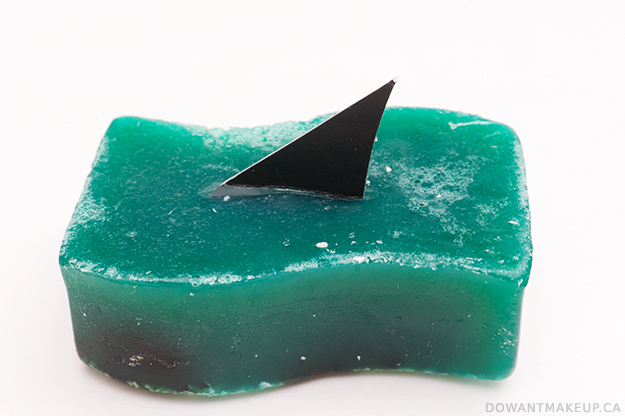 To coincide with Shark Week earlier this month, LUSH released a limited edition Shark Fin Soap. 100% of the $5.95 purchase price goes to organizations working to protect sharks, particularly from finning. Sharks are stripped of their fins for shark fin soup and traditional medicines, then tossed back into the ocean to sink to the bottom of the ocean and die. There's an interesting post on the LUSH website written by Rob Stewart, a director who made a documentary about the finning industry. I'm late to the game and Shark Fin Soap is already out of stock online, although you may be able to still find it in stores. LUSH might bring it back for Shark Week next year, and it's very similar (perhaps identical?) to the Sea Vegetable soap in the permanent range, so hopefully there's still some use in me posting about this. 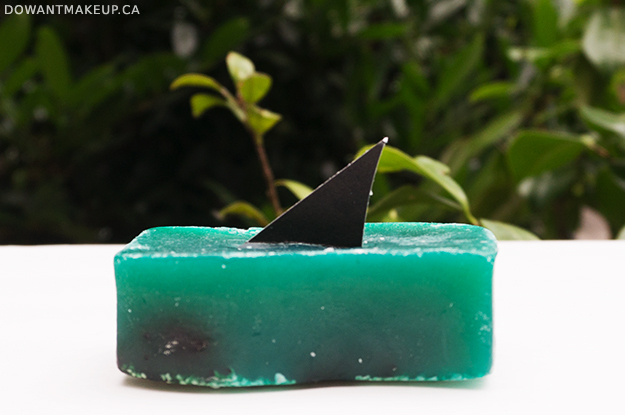 Shark Fin Soap has a refreshing, aquatic scent from lime and lavender oils, as well as seaweed absolute, which LUSH says gives the smell of "seaweed drying on a salt-water beach after a heavy storm." As far as LUSH soaps go, the scent of this one is milder and may be better tolerated if you share your bathroom with someone sensitive-nosed. As with most LUSH soaps, it has moisturizing rapeseed and coconut oils, but it also has a bit of sulfate lauryl sulfate lower on the ingredients list. This soap still feels as hydrating as others I've tried in the LUSH range, but it's something to know if you are sensitive to sulfates. 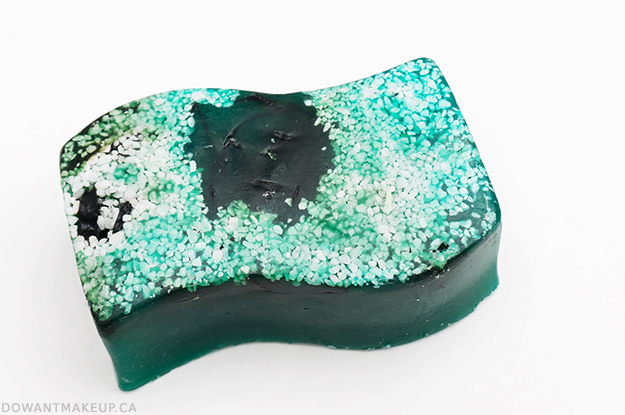 The underside of the soap is packed with coarse sea salt and seaweed, which gives it kind of a two-in-one function: use the top side for a smooth lather, or this underside to get a little bit scrubby. 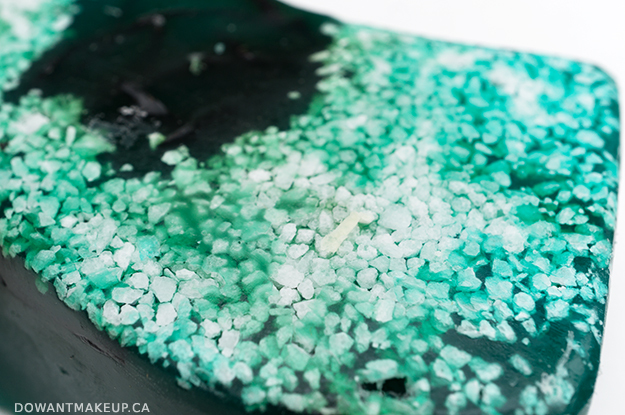 Bonus: all those white, coarse sea salt grains look awfully pretty trapped in a translucent, deep teal. Sea Vegetable is very close in appearance and composition, so if you can't find Shark Fin Soap but like the sound of a scrubby-sided, marine-scented soap, check out Sea Vegetable instead! Are you into Shark Week? I don't really watch it but I do love seeing all the shark-themed releases (including shark nail art!) that happens during that time. Ingredients: water, rapeseed oil (Brassica napus), glycerin, coconut oil (Cocos nucifera), coarse sea salt (sodium chloride), sorbitol, sodium stearate, sodium lauryl sulfate, Arame seaweed (Eisenia arborea), lime oil (Citrus aurantifolia), lavender oil (Lavandula augustifolia), seaweed absolute (Fucus vesiculosus), sodium chloride, sodium hydroxide, EDTA, tetrasodium editronate, citral, geraniol, limonene, linalool, paper fin (cellulose), Blue 1, Yellow 5.